This article is about the mission. For the charachter by the same name, see Octomaw. The Ravenous Octomaw! is the fourth boss mission in Splatoon's single-player mode, Octo Valley. To unlock The Ravenous Octomaw, the player must complete all six missions of Area 4. The Boss Kettle is on a platform in the center that must be accessed via Inkrail. The Octomaw is a gigantic metal fish resembling a Zapfish, with a bear trap-like mouth, sharp teeth and a blue plastic tarp covering the inside. The texture of the body resembles a microphone, with large lips, small eyes and fins, and a rough coat of metal sheets on its underside. The teeth are extremely large and interlocking, creating an inescapable den, similar to an angler fish. Inside of the mouth is a round metal hole. The blue tarpaulin functions as ink-proof gums and lining. Octomaw swims through the ground to the Inkling's position, opening its mouth underneath the spot in a large circle, instantly filling it with purple ink. At this point, the Inkling needs to get outside the "fence" of teeth that has appeared. After a few seconds, Octomaw will snap its mouth shut, instantly killing the Inkling if they're still there. Octomaw will then sit upright and smile at the Inkling for a few seconds, offering free shots at its teeth. Next, Octomaw will dive under the platform and swim to one of the pipes. Afterwards, it will launch its teeth like rockets, each stopping in midair to fire a shot at the Inkling before returning. The teeth can be destroyed in this stage. Octomaw will continue this pattern until it has no teeth left, in which it will dive and repeat step 2 until the next phase of the fight is achieved. To reveal its weak spot, the player needs to simply throw a bomb in Octomaw's mouth while it smiles. This is easier to do with fewer teeth left, so the player should destroy as many as they can. After taking out the first and second tentacles, Octomaw replaces its teeth with what appears to be iron and gold teeth respectively, gold taking the most damage overall. One of the quickest ways to defeat the boss is as follows: Once the battle starts, the Inkling will be facing the enemy. Spray a path of ink 45 degrees to the right, and as soon as the boss charges, swim out of its way using this new path. Once the teeth pop up and the Inkling in the clear, turn around and start shooting at the teeth, quickly moving from one tooth to the next as you destroy them. The boss should get up and smile at you, and at this point, you probably knocked down one to three of its front teeth. If the player has a good shot at the hole, lob a grenade, otherwise, use this smiling period to open more teeth. Only two or three teeth need to be extracted before a clear line of throw is revealed. You should be able to damage it before it does its pipe attack. Repeat the same steps for every stage, and you should eventually succeed. In addition, a single Splat Bomb will instantly destroy all teeth in the first and second phases (provided it has enough blast radius upgrades), providing an easy shot into its open mouth. The third phase requires two Splat Bombs instead. Agent 1: Woohoo! Good thinking Agent 3! Agent 2: Ordinary bombs should do the trick! The Octomaw appears to have been roughly reinforced with scrap metal, suggesting that the machine has been hurriedly repaired since its last defeat. 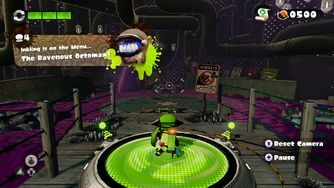 When the player throws a seeker in Octomaw's mouth while it smiles, an exclusive dialogue of agent 1 and 2 will be shown. Through out the stage there are several signs that urge you not to use Splat Bombs (a great hint on how to defeat the boss). There are easter eggs in boss missions. After killing a boss, a mysterious noise that plays in the background when players don't want to collect the Zapfish yet, even after the bosses defeat. The mysterious noise doesn't appear after killing the boss in this mission. The Boss Salmonid, Maws, has a similar way of attacking. It can also be defeated by a Splat Bomb. Spanish (NOA) ¡El voraz Dentabot! The Ravenous Dentalbot! This page was last edited on 6 April 2019, at 20:14.